Iowa has created a beautiful example of bi-partisan support and financial commitment to form a strong statewide STEM movement highlighting proven programs to benefit all students. Iowa students using ST Math are showing AMAZING growth in math proficiency, among the highest in the nation! Iowa has some serious GIRL POWER! Under Secretary of Commerce for Intellectual Property Michelle Lee, also the first female director of the United States Patent and Trademark Office, opened the event by speaking about the importance of closing the gender gap in STEM careers. I agree, and I've written about how legislation would get more girls interested in STEM. It is great to see government officials taking a personal interest in this need. Under Secretary Lee said the Iowa STEM program, led by the Governor's STEM Advisory Council, is positioned to close the gender gap. Lt. Governor Kim Reynolds has long been a STEM advocate and champion for girls in STEM through such initiatives as Million Women Mentors. An excellent role model for all students, I had the privilege of watching female students across the Rotunda excitedly explain to her what they were working on and how STEM was making a difference in their lives! When we finally got to reconnect (she is a busy Lt. Governor after all! ), she shared with me a charming story about how much her own granddaughter was now loving and embracing math, thanks to ST Math and our beloved mascot JiJi! Which led to me giving her a JiJi lapel pin...and taking this awesome photo! Kim Reynolds, Lt. 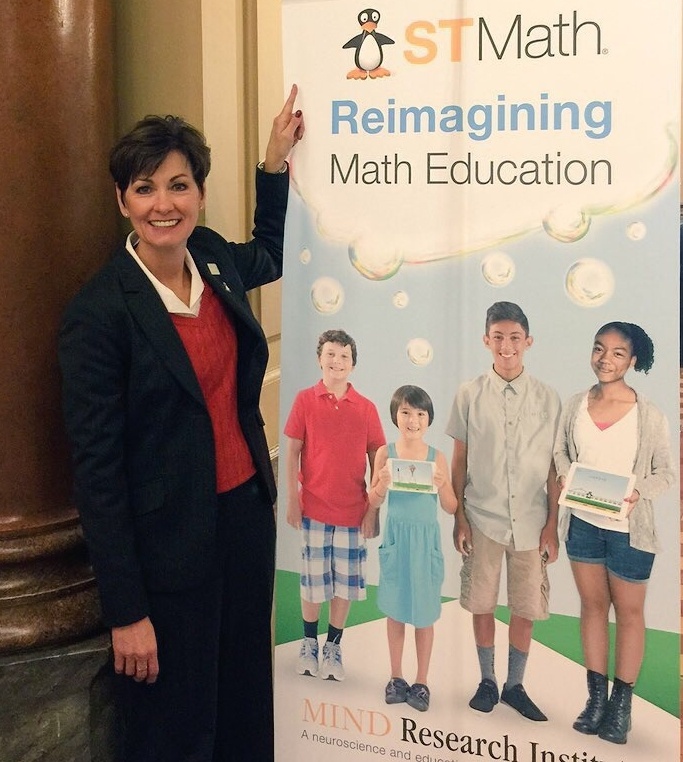 Governor of Iowa, shows off her JiJi pin at STEM Day at the Capitol. The Lt. Governor, along with Kemin Industries President and CEO Dr. Chris Nelson, leads the Iowa Governor's STEM Advisory Council, a public-private partnership of educators, companies and Iowa students and families addressing policies and programs designed to improve Iowa’s educational system focused on science, technology, engineering and mathematics (STEM). And, the STEM Council is getting results. This year’s Iowa STEM Evaluation report found that Iowa students who participated in programs of the STEM Council last year outperformed their peers in mathematics and science across all grade levels on the Iowa Assessments. For the second year, the Iowa Governor's STEM Council has chosen to include ST Math on the short menu of Scale-Up programs that increase student interest and achievement in STEM learning. Created by MIND Research Institute, the Spatial-Temporal (ST) Math instructional program is a uniquely visual, neuroscience-based approach that has proven to dramatically improve student math performance, increase perseverance and build a life-long love of learning. Interested in applying to the program to help get ST Math in your school? The Council's Scale-Up program is now accepting applications for the 2016-17 school year!